A look at all the WNBA’s new jerseys. The Seattle Storm and Symestra have joined forced for a 10-year jersey deal. The Dallas Wings and Texas Capital Bank have a new marquee partnership. HSS is the New York Liberty’s first jersey patch partner. The Indiana Fever have a new partnership with Salesforce. Kalani Brown’s life is complete with her pick by the Sparks. Baylor’s win capped an exciting college season. 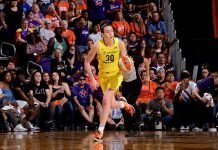 Sabrina Ionescu isn’t a fan of the 24-hour deadline to declare for the WNBA draft. Inside Ionescu’s final hour before her decision. Te’a Cooper will transfer from South Carolina. Kellie Harper has returned home to coach Tennessee. Marquette has named Miami Ohio coach Megan Duffy as their new head coach. Matt Daniel has left Marshall to be the new head coach at Arkansas State. Carly Kuhns is Samford’s new head coach. Brooks Williams is the new head coach at Louisiana-Monroe. Buffalo coach Felisha Legette-Jack says she never went looking for a new job. Iowa coach Lisa Bluder was on “Good Morning America” today.